Romance is far from dead in one part of Inverness. In fact, the timing will be just right tomorrow when the historic Drum Clock is restored to its rightful place on the Merkinch Welfare Hall for Valentine’s Day. The charming Drum Clock, made of barrel type wood with metal coating, was built towards the end of the 19th century and has hung from the Grant Street hall since the 1930s. It was of weight-driven design but was converted to electrical power in the 1970s and painted grey. The clock was originally painted black but the paint oxidised and gave the clock a green colour, with a gold or yellow crown and decoration – and it has now been restored to its original black. The Merkinch Welfare Hall was built in 1914 and, more than 100 years later, is the subject of a community-led Heritage Lottery funded project. The project aims to restore the building to its former glory, creating a gym and changing rooms on the ground floor – for Inverness City Boxing Club – and a community support centre on the first floor. 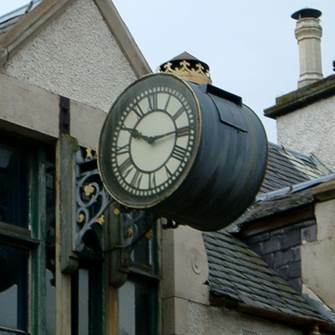 A key objective is to help with the regeneration of Merkinch, and the Drum clock restoration is part of this. Provost of Inverness Helen Carmichael said: “The City of Inverness Area Committee members, through the Inverness Common Good Fund, are delighted to support the restoration of the Merkinch Welfare Hall tower clock.